Note: Video is the edited version, the original has been removed from YouTube. 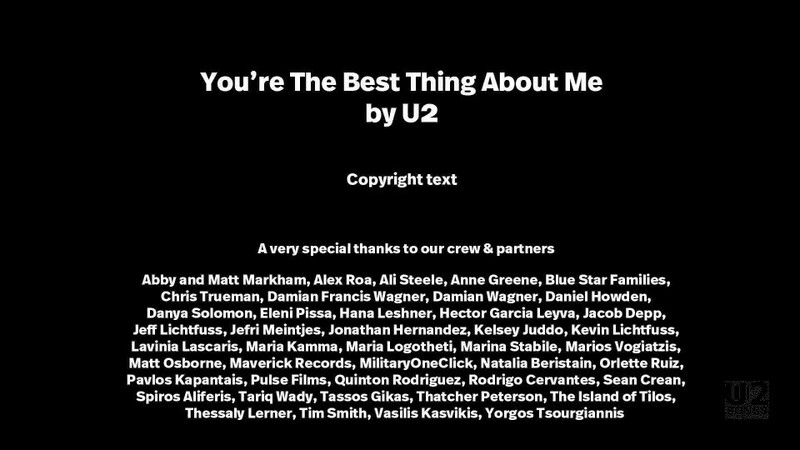 On October 5, 2017, U2 released a fourth video to promote “You’re the Best Thing About Me”, following the lyric video (September 6), the “Kygo vs. U2” version (September 16), and the New York video (September 27). 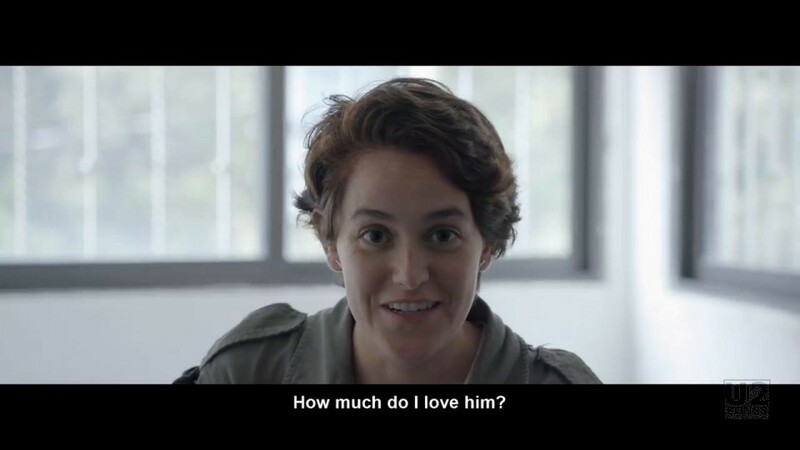 The fourth version, shot in a documentary style by Georgian-born filmmaker Tatia Pilieva, follows four couples over 24 hours as they say goodbye to one another. The video was first uploaded to U2’s Vevo account on October 5, and could be viewed for about 24 hours. The video was eventually removed from that service, and a slight edit was made to the video before making the video available again later that same day, October 6, 2017. 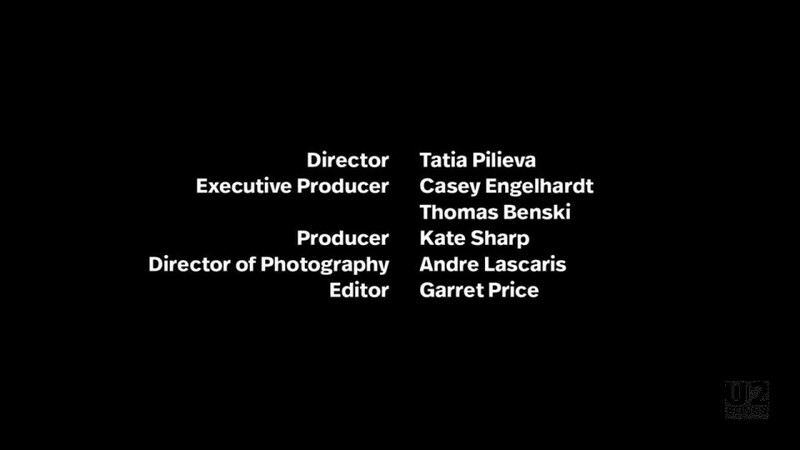 Changes to the credits were also made. 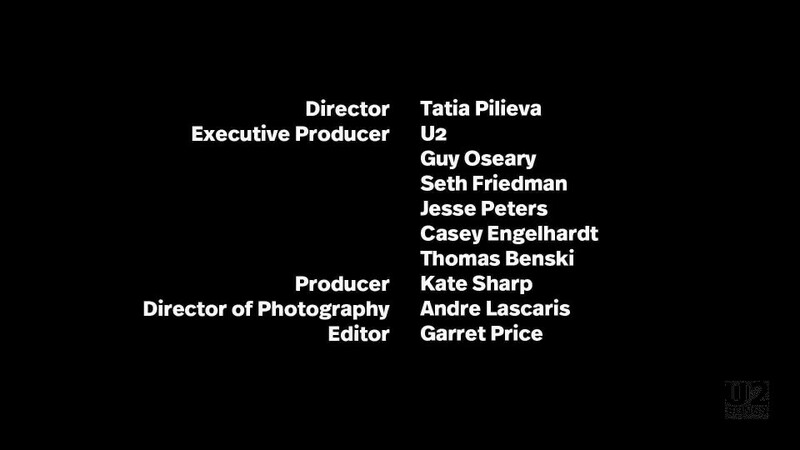 In the original video, the executive producers were listed as “U2, Guy Oseary, Seth Friedman, Jesse Peters, Casey Engelhardt, Thomas Benski.” The second version uploaded shortened this list to say “Seth Friedman, Jesse Peters, Casey Engelhardt, Thomas Benski.” In the second screen of credits a mistake was present in the original upload with a placeholder that read “Copyright text” where the corrected version lists “Published by Universal Music Publishing International B.V.” and has a further “Copyright: U2 Limited” added at the bottom. But the biggest change is an edit of the video itself. The initial video showed a full address for one of the people in the video. In the revised video this address has been edited to remove it. 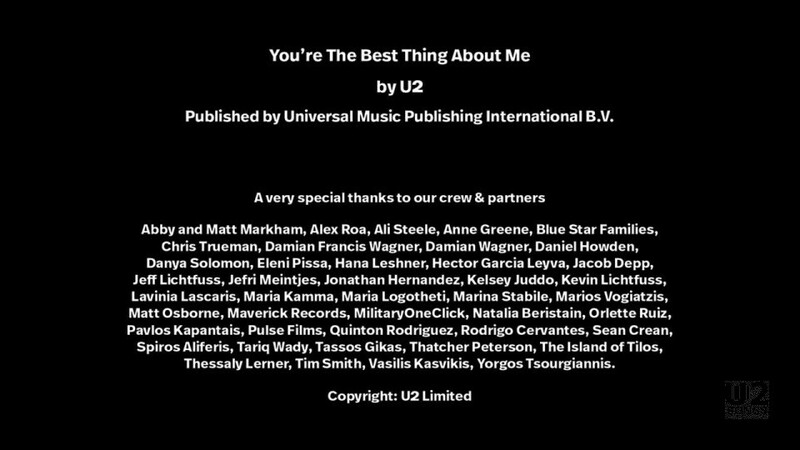 Filmmaker Tatia Pilieva has created a remarkable short film to accompany U2’s new single ‘You’re The Best Thing About Me’. A short documentary about love and separation featuring a newlywed military couple, high school sweethearts, a Syrian refugee family in Greece and a young couple from Mexico City. The film follows each couple for the final 24 hours they are together before one partner has to leave. Born in the Republic of Georgia, Pilieva immigrated to New York City as a teenager and studied film at the American Film Institute. Her 2014 film First Kiss – when she invited 20 strangers to smooch for the first time on camera—became a viral hit (123 million views and counting) and won a Gold Lion at Cannes. The clip is set to the single version of “You’re the Best Thing About Me.” The video opens with interview clips from a few of the couples, talking about the love they feel for their partners. Natural sound and subtitled voices are heard throughout, while the song itself plays more in the background. In an interview with U2.Com, more information about the video was revealed. It was Pilieva that decided the documentary should be about couples that were being forced to separate, including a newlywed military couple, high school sweethearts, a Syrian refugee family in Greece, and a young couple in Mexico City. Pilieva said, “‘The key for me is that when these people are saying goodbye, they are still very much in love. I didn’t want to film a bunch of breakups. I didn’t want to put that into the world. I wanted to put out something positive. Yes, it’s positively heartbreaking, but there’s love all over it.” None of the people in the video are actors, and the video was not scripted in any way. Ciara and Alicia: The military newlywed couple, filmed as Ciara is being deployed. They were filmed on August 1, the day that Ciara was being deployed. India and Matthew: The high school sweethearts from Los Angeles, filmed as both got ready to head to different Universities. They were filmed in early August as India left for the University of California, Berkeley. Matt would also leave home, a month later, attending the University of Chicago. The couple had been together since they were 14. Maha and Abed: A refugee family on the island of Tilos, as the husband gets ready to leave for Athens to find work. The couple have been married for 15 years, and have five children between the ages of 10 months to 13 years. They have been living at a refugee camp on Tilos, 15 hours from ferry from Athens. They were filmed third. A very special thanks to our crew & partners: Abby and Matt Markham, Alex Roa, Ali Steele, Anne Greene, Blue Star Families, Chris Trueman, Damian Francis Wagner, Daniel Howden, Danya Solomon, Eleni Pissa, Hana Leshner, Hector Garcia Leyva, Jacob Depp, Jeff Lichtfuss, Jefri Meintjes, Jonathan Hernandez, Kelsey Juddo, Kevin Lichtfuss, Lavinia Lascaris, Maria Kamma, Maria Logotheti, Marina Stabile, Marios Vogiatzis, Matt Osborne, Maverick Records, Military OneClick, Natalia Beristain, Orlette Ruiz, Pavlos Kapantais, Pulse Films, Quinton Rodriguez, Rodrigo Cervantes, Sean Crean, Spiros Aliferis, Tariq Wady, Tassos Gikas, Thatcher Peterson, The Island of Tilos, Thessaly Lerner, Tim Smith, Vasilis Kasvikis, Yorgos Tsourgiannis.